One of Australia's most spectacular and well renowned road journey's is the famous - Great Ocean Road along the bottom south west of Victoria. One of the most photographed area's in Australia, which includes the famous - 12 Apostles, sandstone formations. This unique road was constructed by soldiers who had returned from the Great War. With shovels, picks and crowbars in hand, these great men built this road and dedicated it to their fallen mates who did not come home. This magnificent roadway was started in 1919 and completed in 1932. To enjoy this unique touring experience, we suggest you allow 3 days to do this drive, giving you enough time to visit the many attractions and landscapes of the Great Ocean Road. The start of a Great Ocean Road tour is the beautiful surfcoast region of Torquay , which is only 95km Melbourne. 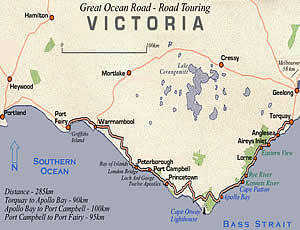 This road trip should be included on any Motorhome, camping or Caravan holiday of Victoria. Driving south from Torquay you will go past the famous surf beach of Bells Beach, so take the board with you, as there are many great surf locations on the Great Ocean Road. Along the coast hugging road, there are many wonderful towns and National Parks to stop and enjoy, with plenty of photo opportunities. You can shop and dine in the quaint towns along the way. There are also lighthouses to visit, wharfs where they bring in lobster and cray fish. From Apollo Bay your drive meanders through the lush farmlands and forest of Otway National Park. You should also visit Cape Otway to see some of the best kept historical lighthouses. For stunning rainforset views climb the Ötway Fly" in the forest, an elevated walkway through the forest. Further along we come to the famous Twelve Apostles rock formations, Lochard Gorge and London Bridge sandstone formations. All along the route, the attractions are well sign posted. There are many activities and interesting features to participate in on the Great Ocean Road. So if you need a weekend getaway that you will remember forever, take a trip down the Great Ocean Road.